Oh, and murderers. Can't forget murderers. 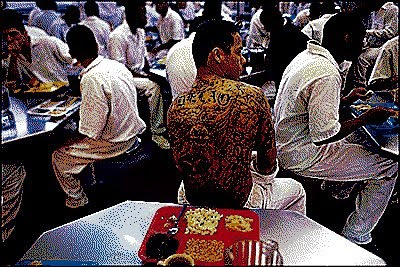 These convicted felons and parolees appear to be one of the Democrat Party's most valuable voting blocs -- along with illegal immigrants. Under the guise that prisons contain too many minorities, the liberal activists on the Supreme Court appear to have ordered the administration to review the policies of all 48 states that currently deny prisoners the right to vote. ...In every state, the impact on the black community is disproportionate, hardly surprising given that one in nine black men aged 20 to 34 is in prison. Even so, the numbers are startling, with disturbing implications for civic life in a democracy. According to an analysis by the Sentencing Project, a research and advocacy organization in Washington, felony convictions have deprived 20 percent of African-Americans in Virginia of the right to vote, compared with a 6.8 percent disenfranchisement rate for Virginia residents as a whole. In Texas, a similar ratio applies: 9.3 percent for blacks compared with 3.3 percent for Texans as a whole. In New York, 80 percent of those who have lost the right to vote are black or Hispanic. Nationally, an estimated one in seven black men has lost the right to vote. As an aside -- for the first "post-racial" presidency, there certainly appears to be record levels of race-baiting and Balkanization going on in Washington. But I digress. What the utterly incompetent Linda Greenhouse, author of this particular DNC press release, fails to observe is as startling as it is simple. 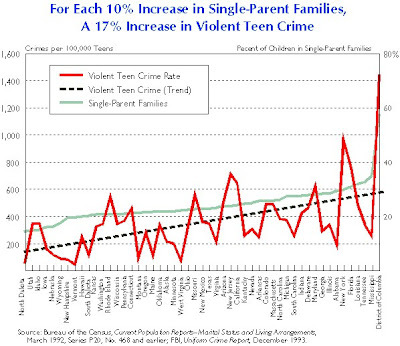 Of 23 peer-reviewed U.S. studies since 2000, 20 found that family structure directly affects crime and/or delinquency. Most research "strongly suggests both that young adults and teens raised in single-parent homes are more likely to commit crimes, and that communities with high rates of family fragmentation (especially unwed childbearing) suffer higher crime rates as a result." 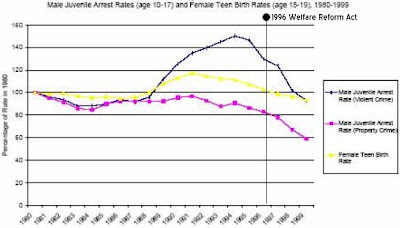 One study that ran more than two decades found that nearly 90% of the change in violent crime rates can be attributed to the change in percentages of out-of-wedlock births. Conversely, divorce rates had no relationship with crime. In The Atlantic Monthly, Barbara Dafoe Whitehead noted that the "relationship [between single-parent families and crime] is so strong that controlling for family configuration erases the relationship between race and crime and between low income and crime. This conclusion shows up time and again in the literature. The nation's mayors, as well as police officers, social workers, probation officers, and court officials, consistently point to family break up as the most important source of rising rates of crime." 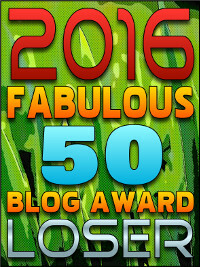 Got that, Greenhouse? Control for single-parent families and there are no differences between the races when it comes to crime. Stop incentivizing single-parent families and you'll stop getting so many minority prisoners. But Democrats want blacks to head en masse to prison, it would appear -- as their policies have indisputably resulted in record numbers of single-parent families. Unchecked access to welfare, 99-week unemployment checks, bonus checks for kids born out of wedlock, you name it. All that said, will the Democrat Party ever stop its despicable race-baiting practices? That's a rhetorical question, of course. Darrell Issa's ObamaCare Caption Contest! For the love of --- I just ate! When did the NAACP join the Klan? Ladies and Gentlemen, We Have a Wiener (Part II)! Ladies and Gentlemen, We Have a Wiener!